Prehistory For as long as there have been men and otters, men have hunted otters for their skins. 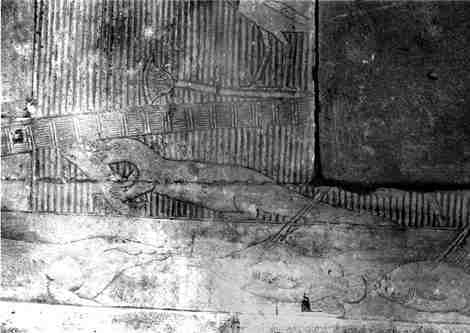 2300 BC Otter pictured in bas-relief in the Mastaba of Mereruka, Saqqara, 6th Dynasty c. 2300 BCE (thanks to Joseph A.Davis for the photograph). 75 to 79 AD In his "Natural History", Pliny the Elder classified otters as beavers! 700 AD Life of Saint Cuthbert by the Venerable Bede: "He was in the habit of rising at the dead of night, while everyone else was sleeping, to go out and pray, returning just in time for morning prayers. One night one of the monks watched him creep out, then followed him stealthily to see where he was going and what he was about. Down he went towards the beach beneath the monastery and out into the sea until he was up to his arms and neck in deep water. The splash of the waves accompanied his vigil throughout the dark hours of the night. At daybreak he came out, knelt down on the sand, and prayed. Then two otters bounded out of the water, stretched themselves out before him, warmed his feet with their breath, and tried to dry him on their fur. They finished, received his blessing, and slipped back to their watery home. He was soon home and was in choir at the proper time with the rest of the monks." (Thanks to David Brear, who brought this to my attention). 1555 Olaus Magnus says "But in Sweden with some great men they [otters] are made so tame, that when the cook gives them the sign, they will hop into the fish-pond, and bring forth a Fish of that bigness he commands them; and then another, and a third, until he hath done enough as he was bid." Gudger (1927) also gives a copy of the charming picture by Magnus of this scene. mid 17th Century In the memoirs of Jan Chryzostom Pasek, the Polish country landowner, he tells how he gave his pet otter, "Worm", to King Jan III Sobieski of Poland. The King loved the otter and looked after him. Unfortunately one night, Worm went for a walk, and some soldiers, not knowing he was the King's otter, shot him and had his skin cured. When the King found out, he was so angry he put the soldiers and the tanner into a prison tower (thanks to Karina Chruszcz for this story).